Square a line across at K, indefinite length [about 2”]. To complete the front draft, slash from L to M, and cut out the waist dart from N to M and O to M; then pivoting at point M, swing front, so that point P touches the squared line, near point K as shown in diagram 3. H to Q – Equals space, L to M N to Q – Connect. O to Q – Connect. Make dart in back below waistline in same manner as in front. This completes the draft of the ‘chest slant’ dress foundation. No seams are allowed. 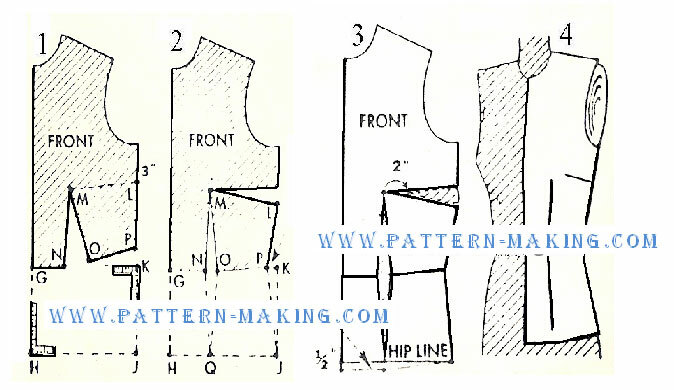 See directions below for making the ‘shoulder dart’ or the ‘side dart’ dress foundation. (1 and 2) The method of drafting this front is similar to the draft of the ‘chest slant’ foundation, with on exception, that instead of slashing from center front shoulder to breast point [L to M], you slash from center of shoulder to breast point L to M and pivot front at point M so that point P touches the squared line near point K, as shown in diagram 2. Connect P to J and make the waist dart. (3) To complete the front, draw V-shaped dart from shoulder seam to about 2” above breast point. Add 1/2″ to length at center front, to nothing at side seam. (4) Cut out front in muslin; then make the shoulder and waist darts. Try muslin fitting on dress form. (1 and 2) Repeat method of drafting the front foundations, but for the side dart; slash from side seam to breast point L to M, and swing lower side part of front [pivoting at point M], so that point P will touch the squared line near point K, as shown in diagram 2. To complete the foundation, connect P to J, and then make the dart below waistline. (3) Draw V-shaped dart from side seam to about 2” from breast point. 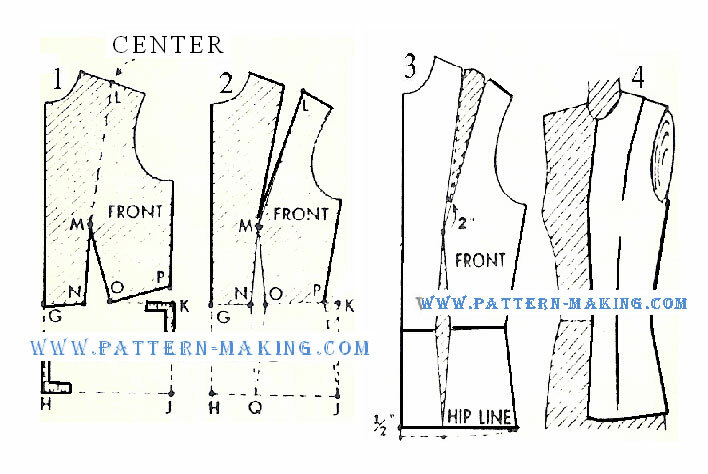 Lengthen center front 1/2″, to nothing at side seam (4) Make muslin fitting and try on dress form.